2012 Aprilia Dorsoduro 750. Picture credits - Aprilia. Submit more pictures. The concept that revolutionised the world of Supermoto has now engendered the Aprilia Dorsoduro 750. This unique, elite motorcycle applies all of Aprilia�s vast racing experience to just one mission: the offer of pure riding enjoyment. 92 HP and exclusive Tri-Map ride-by-wire technology mean that the lightweight and powerful Dorsoduro 750 can satisfy even the most expert riders in search of a state-of-the-art motorcycle. Ask questions Join the 12 Aprilia Dorsoduro 750 discussion group or the general Aprilia discussion group. Click here to sell a used 2012 Aprilia Dorsoduro 750 or advertise any other MC for sale. 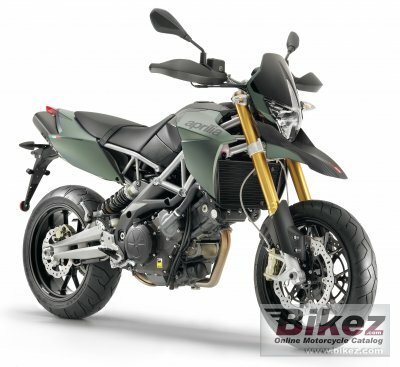 You can list all available Aprilia Dorsoduro 750 bikes and also sign up for e-mail notification when such motorcycles are advertised in the future. Ads with or without pictures are easy to create. Our classifieds are completely free with sections for every country in the world. You can also check out our list of related motorbikes. Compare technical data. Look at photos. View your fellow riders' rating of the bike's reliability, design, engine performance, accident risk, repair cost, etc.